Sometimes, we get so used to certain equipment that we don’t put our effort into looking for better options. And when we finally do, we realize we should’ve done that a long time ago. That is what happened to me with my old table tennis table. I used to think that it was good enough, and there was no need to look for other options. However, after playing a few games on this new table, I could not resist doing my own Joola Inside Table review. This table made my old table out-dated very quickly, and now I regret I had not tried it sooner. 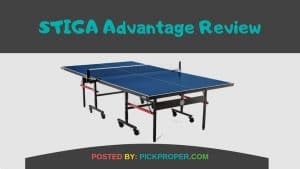 Whether you are a professional or an amateur player, this is a table you should consider if you’re looking for a new table. Because let me tell you, it is a massive improvement in comparison to other models. Here, I’m going to tell all the reasons why this equipment has left a good impression on me. 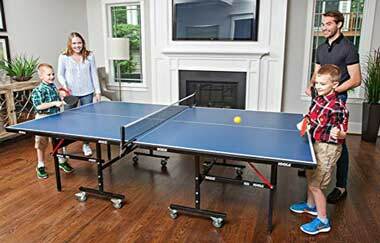 A high-quality tennis table should provide what a professional table offers, while also delivering high versatility to use it at different circumstances. This is one of my personal beliefs when I look for the best ping pong table. Naturally, I glare for the most optimum and capable product, but at the same time, it should meet my demands if I want to use it around the house, at an outdoor location, or to move it over to a friend’s house. 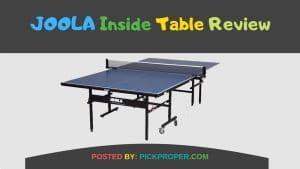 The Joola Inside Table is one of those tables that quickly had my interest because I consider it fulfills plenty of these expectations I had. It is a product easy to adjust, requiring only a couple of minutes to set up. After you do, you will have a range of possibilities for your playing style. The table displays one sturdy undercarriage that features 1.5-inch steel legs. Once you set the table in a comfortable area, the steel legs will ensure you have a highly effective table by keeping it in its place under great stability. An important observation to make about the legs is that they include rubber. This keeps the floor from getting scratches and other types of damages that come from sudden movements. It is very suitable if you have a wooden floor. The table also features a quality net as well as an effective post set. These elements make this product an option worth considering when you’re looking for a new table. In order to provide a product easy to control and adjust, the Joola Inside table features two halves that you can move around independently. These two halves make the installation process much easier, but they provide other benefits as well. As a matter of fact, they are great when you need to move the table around. You can quickly dismount all of its pieces, and start moving them without putting your body at risk of suffering an accident. This table is USATT approved, which gives it a solid backup that guarantees its quality. On top of that, it is a product from the official brand of both the US Open as well as the US Nationals Championship. These two institutions put their reputation at the line by certificating this product. These certifications make this table highly effective for different purposes. Players will have the option to use it for training, amateur games, and even tournaments they participate in. The table features two folding halves that have their support over a 4-wheel trolley structure. It allows everyone to higher mobility reducing possible accident risks. Furthermore, it includes an anti-tilting system that locks the table and the wheels efficiently making it remain still in one place. These two safety measures are much appreciated, especially because they make our life easier when we are playing, or moving the table for storage purposes. Of course, like any good table, the Joola Inside Table also offers the possibility to play solo. It is way more fun playing against another human being, but testing your skills in a single training session allows you to see where you can improve. These are the main benefits this table provides. As you can tell, it is a very effective product that assists your games effectively. If you don’t have prior experience setting up a table like this one, then you could require extra assistance to get it properly set up. 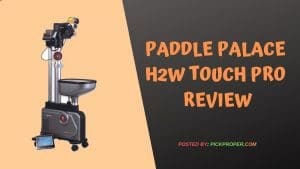 The table includes a manual, but sometimes that is not enough, and it could leave you with more doubts than answers because of the technical terms it uses. Luckily, there is always information online to help you during these circumstances. If you don’t have access to an online source, having someone else to assist you becomes another option. The table is quick to set up and install, but it is still recommendable to check if everything is in its proper place. More specifically, we are talking about the screws. Check if they are the correct size and if they are where they need to be. Additionally, you should take a closer look at the bolts as well. Make sure they are tightened accordingly to what the table requires. By doing a quick checking, you will notice if there are some issues you need to adjust before using the table. This could prevent awkward accidents from happening. This table is recommendable to use for recreational purposes. Having it around the house or at the office is a good decision to make, but it is not optimum for professional applications. There are better options available if you are looking for a table to use at a professional level. After finishing our Joola Inside Table review, I hope you now have a better understanding of what this table has to offer. Make sure you choose your table wisely. Plenty of fun and amazing moments will depend on you making the right call, and choosing an inadequate table can ruin your gaming experience. pickproper is a participant in the Amazon Services LLC Associates Program, an affiliate advertising program designed to provide a means for sites to earn advertising fees by advertising and linking to Amazon.com. *Amazon and the Amazon logo are trademarks of Amazon.com, Inc., or its affiliates. 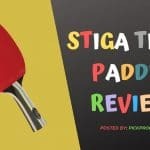 Stiga Titan Review – An Inexpensive Paddle! 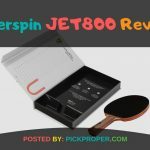 Killerspin Jet 800 Review – Everything You Need to Know! Copyright © 2019 · PickProper.com · ALL RIGHTS RESERVED.